Change the colors, the fonts, the wording and beyond until you’ve created the invitation you’ve always wanted. We make customizing every invitation fun and easy but we’re also here to answer your questions whenever you need help. Reach out to our customer service team. They’re happy to talk with you! Play with the colors of your invitation’s design and wording until you find the combination that coordinates perfectly with your event’s look. Many invitations include additional accents like satin ribbon and invitation pockets often available in a variety of colors. We think it’s important to offer real world examples of wedding invitation wording on every invitation we design to help guide our customers in choosing the right wording for their wedding. We also offer many other wording options when personalizing your invitation not to mention you can write your own. Fonts can change the look of your wedding invitation drastically. We pay close attention to the fonts we feature in every design but if you don’t like them, change it up when you begin personalizing your invitations and choose from the many other fonts we offer. View all of our available fonts here. When you begin personalizing your wedding invitations, you’ll see an area labeled “Add Design Request” below your wording. You can enter small changes here and we’ll take care of it for you. Things like changes in wording, spacing, font size, etc. Just let us know! We are happy to accommodate design changes for our customers, and most of the time we can without a problem. Perhaps you want a specific design in a horizontal format but it’s only offered in a vertical format. We can do that! Maybe you want a certain design on a different invitation size? We can do that! You might even want us to print on the back of your invitation? We can do that, too! Get in touch with our customer service team to see what we can do for you. Add a touch of sparkle to your invite by upgrading to shimmer paper or give your ensemble an elegant feel with textured paper. Paper options are available on many of our invitations. Some of the invitations and most of the save the dates and announcements we offer can even be ordered as magnets — a popular choice recipients love! 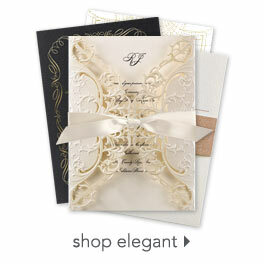 Create a gorgeous wedding invitation ensemble with the perfect finishing touches. Upgrade to shimmer envelopes for a bit of sparkle or Fastick envelopes to make assembly quick and simple. Leave your stylish mark on every envelope with custom address stamps or add a pop of color to your ensemble with colored envelope liners. There are so many ways to make a wedding invitation truly yours! Don’t want to hand address every single wedding invitation you plan to send? We get it! Let us do the tedious work for you. We will print a return address on all of your response cards for free, and we are happy to address your wedding invitations (for an additional fee). Save yourself the time and stress that comes with hand addressing envelopes. You won’t regret it.